You look around you and notice things. You enjoy doing new things and telling people about them. You enjoy noticing when things are like each other or when things have changed. 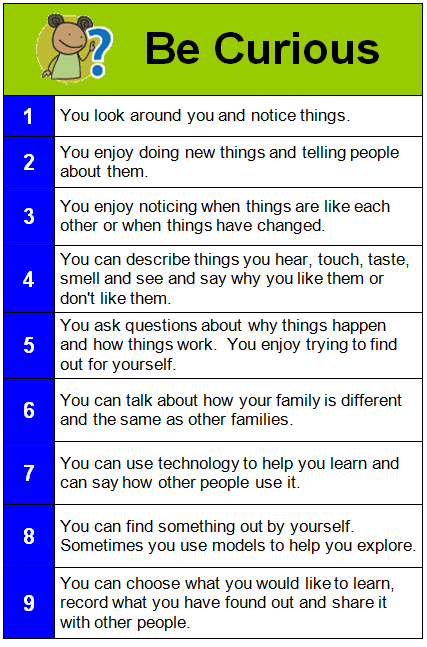 You can describe things you hear, touch, taste, smell and see and say why you like them or don’t like them. You ask questions about why things happen and how things work. You enjoy trying to find out for yourself. You can talk about how your family is different and the same as other families. You can use technology to help you learn and can say how other people use it. You can find something out by yourself. Sometimes you use models to help you explore. You can choose what you would like to learn, record what you have found out and share it with other people.